Bring on Spring: Refresh Your Hair and Makeup Routine! Alright, we’ve Cleaned the House, Updated the Decor, Refreshed our Wardrobes, and now for the final Spring Refresh-Hair and Makeup! Just like with our style refresh, I’m not means an expert on this area, I just know what works for me. As a mom of three kids under 7 I have oh, about ten minutes a day where someone isn’t pulling at my shirt or fussing and yelling for me! Like many of you I had to tweak my beauty routine as life “happeneed” to make it work for me and I have to say I have it about down to a science. For me the key was making things as easy and fast as possible. Many of you might not realize that I have extremely curly hair. About a year and a half ago shortly after my third son was born (and my husband was still deployed) I took the plunge and had it straightened with keratin. Life. Changing. Seriously. I was very nervous because I loved my curls but wrangling three little ones left me zero time for the styling it required…not to mention that the baby grabbing a fistful usually meant a frizzy spot until my next shower! For me, having the keratin treatment means my hair is literally wash and wear now. It’s taken a huge amount off of my styling routine! I do have to say that once my hair was straight I had absolutely no idea what to do with it at first! 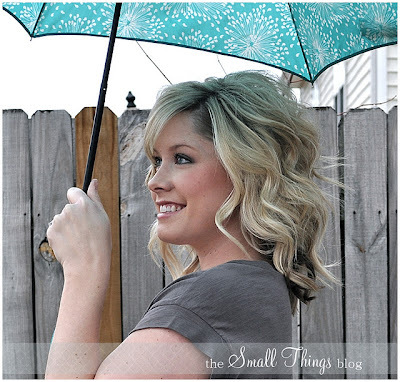 Luckily I stumbled across The Small Things Blog where fellow North Carolinian and Pinterest Super Star Kate shares her ah-mazing hair tutorials! She literally taught me everything I know about how to do my hair now! Some of my favorite tutorials of hers are Loose Waves, Casual Half Up, Bouncy Curled Under, and Not Just a Ponytail. If you haven’t been to her blog you absolutely MUST check it out! Neutrogena Eye Brightening Eye Illuminator-it actually makes me look like I got a full night’s sleep! My biggest tip would be to use a brightening under eye concealer. Get a color a touch lighter than your natural skin tone with a yellow undertone and instead of dabbing it directly under your eyes (which can create a raccoon effect) create a triangle from the inner corner of your eye to the outer corner and down towards the side of your nostril. In seconds you will feel polished, awake, and bright eyed! You also totally need to check out her fast Mommy Makeup tutorial (amazing!) and her Twirl Curl Tutorial. My favorite thing right now is Dr. Jart BB Cream. Using a GOOD BB cream saves a lot of time because it’s a moisturizer, primer and foundation all in one. This particular one is my favorite because it gives solid medium coverage, unlike others I’ve tried that really don’t cover much. The formula is crease-resistant, so you won’t have to worry about touching up throughout the day. My favorite tool for on-the-go eyes is a good fluff brush. Eyeshadow can take forever, but with a good blending (fluff) brush you only need a highlight color and a crease color to add definition, and you can apply them both with the same brush! A good eyeshadow duo makes this part quicker too — I love the Hourglass Visionaire Eye Shadow Duo in Ivory Shimmer/Light Beige Shimmer. The formula goes on silky smooth and the shades are great for almost any skintone. I just apply the darker tone on the outer half of my lid, and the lighter tone on the inner half and browbone, all using the fluff brush. After that I just add some mascara, blush and lipgloss, and I’m out the door! The whole thing can take under 5 minutes but it looks like you spent a LOT more time on it. Thank you so much to Tiffany and Cara for offering that awesome makeup advice!! Are you a makeup maven or do you struggle like me? I’m going to try to take the advice of Cara and Tiffany and really work on getting in the routine of putting it on each day-with tips like theirs there is really no reason not to! Thanks so much for following along with me this week, don’t forget to enter to win one of two $175 gift cards and be sure to pop back by next week because I have LOTS of Springtime crafting and decor ready to share! Hi Melissa – I just loved your comment about “prettying yourself up” before your husband got home! I used to do the same thing when my two were little! Poor little things, they probably wondered who that person was with them all day! I do consider myself a bit of a makeup maven, mostly because I have to put on the face for work everyday. Sigh! Sometimes on the weekend, though, I have to remember to “pretty up!” Thanks for the fun post and have an awesome weekend! I totally understand Cindy-before I had kids when I worked I always had makeup, perfume, jewelry etc on. Now it’s like a whirlwind in the morning and it just doesn’t happen much-then I blink and it’s dinnertime! I just remind myself it’s just one of life’s “seasons” and soon they’ll be older and things won’t be quite as chaotic and I’ll have a little more time! Oh my goodness. I need help in this area! I get up faithfully at 5 am everyday and get ready before everyone gets up, But the results are never really that exciting. I just end up looking semi-presentable instead of a mess. Off to visit all the blogs you mention and get some inspiration! Great tips and I definitely need a new Spring look! Glad I hopped over to visit … can’t wait to spend a little time visiting the blogs you shared! Thanks Keri-be careful, you’ll get sucked into those awesome hair and makeup tutorials! I’m ALWAYS forgetting to put on makeup! But Morgan likes it, so most of the time, I don’t even bother! Those are some amazing tips… I actually have very curly hair, too. I’m always drying it out straight and then curling it with a hot iron. How often do you have to get the keratin treatment? I’m curious! There are two types of keratin treatments, one last six weeks and they usually call it a “keratin blowout” around here. I get the full treatment and I only do it every six months. The thing I love about the keratin is that it slowly fades off and your curls/waves (and frizz) come back so it’s not permanently changing your hair. It makes your hair so soft and silky-which was amazing for someone who grew up with coarse crazy curls! It’s time-consuming, my hair is very long so it takes 3-4 hours, and it is expensive ($200 and up depending on where you live) but I don’t even really trim it other than those visits so for me it’s crazy worth it. Look at me doing something right!! I love Dr. Jart BB cream too!! Okay. That’s the extend of my good. I need to get on that! I need lessons! Think your friends travel? Offbeat and Inspired always has great tips! I am also a huge MAC fan. Thanks for sharing all these great tips. I always could some some good hair and makeup advice. i know you always wish for what you don’t have, but boy i would love curly hair!! my hair is so fine, it doesn’t hold curl or style at all! anyway, great post!!! Check out Kate from The Small Things Blog-she seriously can work magic and has some great product recommendations for fine hair! Right?! Blech, I’ve gone out to get lunch at work and had my hair freeze in the cold air because it was still wet from the shower I took six hours earlier! And of course, hair dryers or straighteners were right out because in the end they just made the frizz worse! I have always had straight hair! I would kill for some curl or maybe just some volume or thickness! Your hair is awesome! Oh man your hair!!! What a huge difference! Wow! That’s amazing. I love both of those ladies! 🙂 I am a bit of a youtube stalker of MaskCara and a few other hair/ makeup ladies. It’s fun watching other women do their makeup and inspires me to care more than just slapping on a little mascara and running out the door. 🙂 Good advice! I’m gonna try the eye brightener and the mascara! I need something a little new and different! You hair looks beautiful both ways but I totally understand wanting to go with what’s easier. My hair was super straight most of my life and then I had kids and now it has this crazy wave to it! Growing it out has made it so much easier to work with.